We documented the build and are providing full construction details in the following pdf document: Prutchi Paint Can Scintillator. The surplus availability of specific PMT models is very variable, so for the benefit of our readers, we decided to base this design on the XP5312/SN – a PMT that is currently widely available in the surplus market from Sphere Research (who kindly provided the PMT for this project). 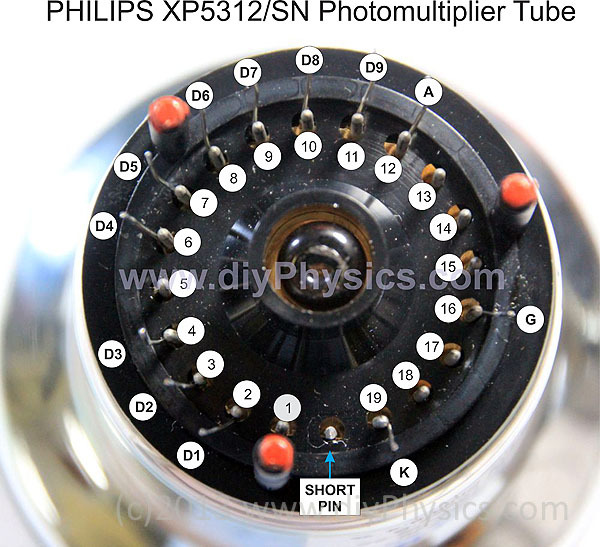 The tube used by Philips uses a custom flying-lead pinout that is different than the one shown in datasheets for retail versions of the XP5312. It took some experimenting to figure out the correct pinout for the Philips XP5312/SN, but it was easy to assemble the probe once we sorted that out. 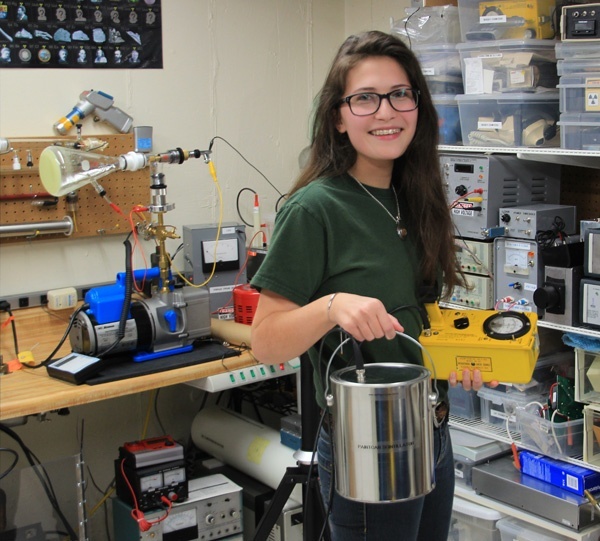 We enclosed the probe inside a paint can. 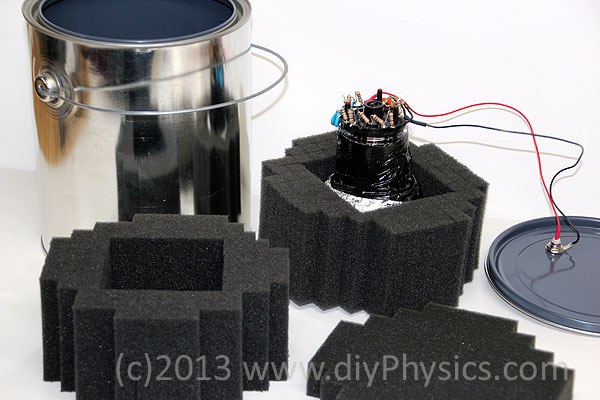 The PMT/plastic scintillator assembly is protected and held in place within the can by polyurethane foam. 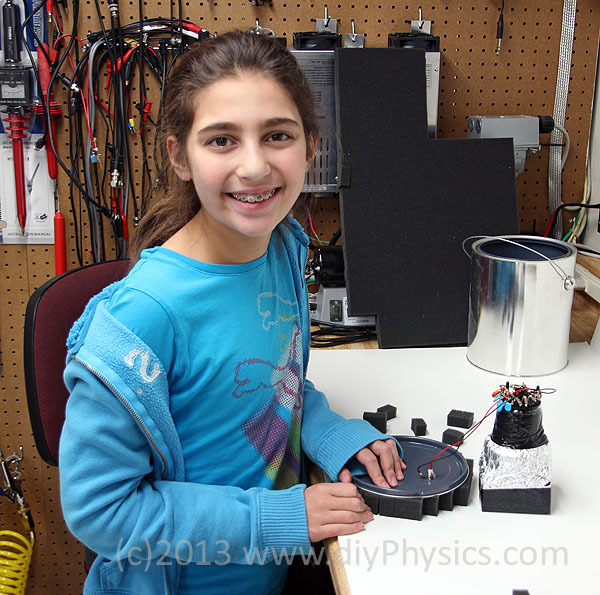 Abigail helped us make foam inserts from pre-scored foam blocks that we had available. The average background count of the probe is around 1,000 counts/minute in our home lab where a Polimaster PM1703M counter measures a dose rate of 5 µR/hr. The count rate using the paint can scintillation probe is 7,400 cpm from a 137Cs 6.7 µCi exempt source (originally 10 µCi, manufactured in 1995) at a distance of 30 cm, where the Polimaster PM1703M measures a dose rate of 20 µR/hr. 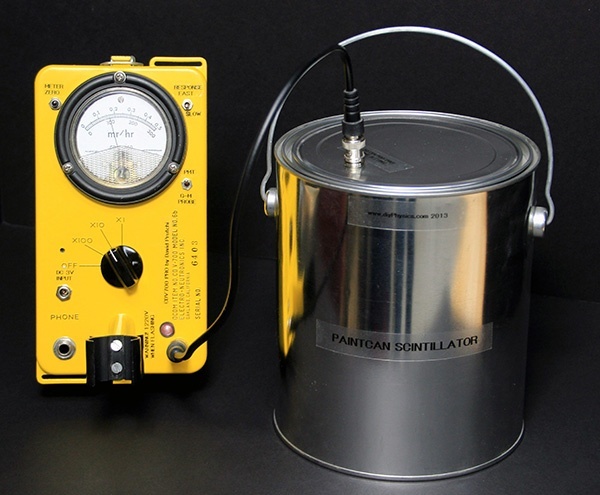 The high sensitivity and convenient portability of this probe make it ideal for radioactive mineral surveying, as well as for “urban surveying” to find miscellaneous gamma-ray sources. PS. Jan 13, 2013 – George Dowell, owner of GeoElectronics, and moderator of the Yahoo! GeigerCounterEnthusiasts group told us that he has scintillation plastic available for sale to experimenters. He has over 40,000 square inches of plastic scintillator, all 1 1/2″ thick, lengths up to 7 feet long. Look for George as eBay® Seller GeoElectronics, or contact him through the GeigerCounterEnthusiasts list. PS. #2 Jan 13, 2013 – Walter Shawlee 2, President of Sphere Research Corporation asked me to pass along that if you mention DIYPHYSICS, Sphere will sell you the XP5312/SN for $49! 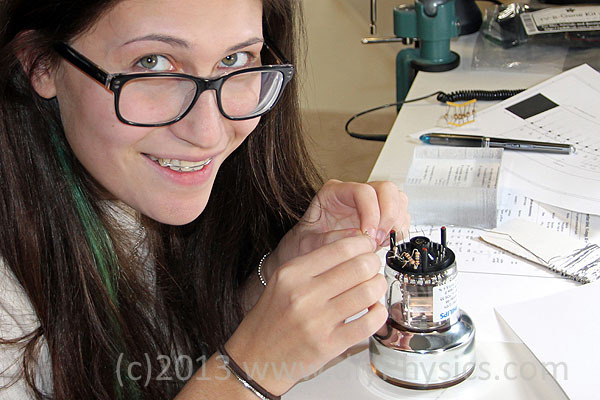 Click here for the pdf file containing complete instructions on how to build this probe. « Bad Physics at the Equator – Shame on the Intiñan Solar Museum! You folks are awesome ! That’s a really nice project. How much current do you really need to operate the PMT? We’ve finished a simple Raspberry PI Geiger-Mueller interface and were wondering if we could use our high voltage principle (inductive kickback) to drive a PMT and connect that to a Raspberry PI as well. What do you think? You can get away with a dynode voltage divider that will draw around 10 microAmps at the typical 1,250V just for counting low-activity sources. However, you will need higher current and low ripple to be able to perform any kind of spectral analysis. This project was a lot of fun. Works great! Thxs!